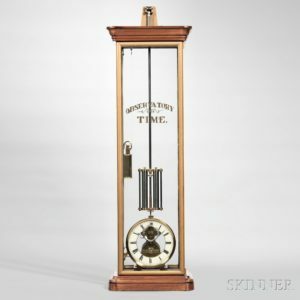 Back to the Future: Skinner Clocks, Watches & Scientific Instruments Auction Features Mechanical Marvels, April 28 | Skinner Inc.
Skinner, Inc. is pleased to present an auction of Clocks, Watches & Scientific Instruments on Friday, April 28 at 10AM in Marlborough, MA. 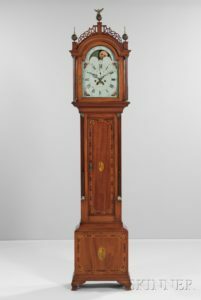 Robert Cheney, Director of Clocks, comments that the nearly 400 lots in this auction are widely varied, and include great rarities for the specialist connoisseur, fine clocks from America and Europe, intriguing musical novelties, and affordable microscopes and telescopes. 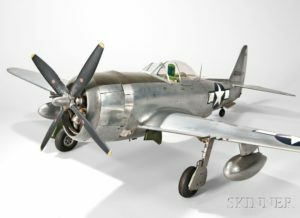 Numerous highlights of this auction are from the Wing Collection, started in the 1920s by Henry Wing of Greenfield, Massachusetts and expanded by his son Donald. Wing family members were innovative specialty manufacturers with a passion for anything mechanical, collecting machinery both large (tractors and cars) and small (watches and chronometers). Outstanding lots from the Wing Collection include two machines by Holtzapffel of London, which Cheney notes are likely the rarest pieces offered. These specialized lathes can perform turning operations on prized materials such as precious metals, ivory, and exotic woods. The resulting intricate patterns embellished luxury goods such as watch cases and a variety of objets de vertu. Sheer ingenuity distinguishes a number of pieces in this auction. Musical mechanisms are well represented, with over two dozen musical boxes alone. The most elaborate is Lot 433, Grand Format Piano Forte Musical Box by Nicole Frères, circa 1854, playing four opera overtures ($15,000-20,000). ♦ J.F. Houdin Animated Conjuror Clock, France, c. 1840, ormolu and patinated bronze. The timepiece is topped by a magician performing a cup and ball trick activated by the clock on the hour or manually by a lever (Lot 291, $35,000-45,000). ♦ Republic-47D Thunderbolt U-control Model Airplane by Ernest Berke, constructed 1956-65, 1/12th scale model, 43-inch wingspan. Nine years in construction, the model was made to the original aircraft’s blueprints and won first prize in the national competition for model aircraft in 1964 (Lot 414, $6,000-8,000). 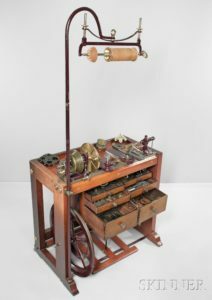 Curious collectors, whether their primary interest is in the tools of scientific inquiry of the 19th century, or examples of its technology, design and fine workmanship, will find much to admire and acquire in this auction. Auction previews are free and open to the public and held in Skinner’s Marlborough gallery, April 26, 12PM-7PM, April 27, 12PM-7PM, and April 28, 8AM-9:30AM. Illustrated catalog 3003M is available from the Subscriptions Department at subscriptions@skinnerinc.com or from the Gallery. Prices realized will be available online at www.skinnerinc.com during and after the sale. The Skinner website also enables users to view all lots in the auction, leave bids, order catalogs and bid live, in real-time through SkinnerLive! This entry was posted in News and tagged age of exploration, american clocks, and American clocks, antique clocks, auction, brass fluted, brass stop, brass-faced pendulum, carriage clock, carved, case clock, cast iron banks, cherry clocks, Clocks, Coin-operated Mills Novelty Violano Virtuoso, compass, complex musical boxes, eight-day brass movement with hour strike, european clocks, floral spandrels, fluted, french clocks, gilt-brass, glazed hood door, horological, hour repeating, inlay on ogee bracket feet, line inlay, mahogany clocks, mantel clock, marlborough, mechanical banks, moon's age dial, music box, musical box, navigation, needle, ormolu, painted iron dial, pocket watches, quadrant, quarter-columns, regulator, repeater alarm, repeating circle, Robert Cheney, rosewood, scale, scientific instruments, sighting vane, Skeleton Clock, skinner, tall clocks, Tiffany, timepieces, tin-cased weights, tripod mount, wall clock, walnut clock, watches by Skinner. Bookmark the permalink.